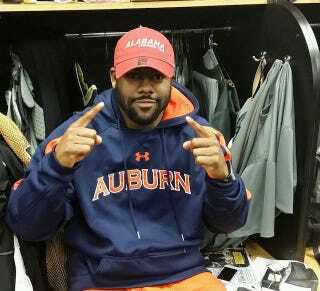 Saints running back Mark Ingram played college ball at Alabama, a team which you may remember losing the Iron Bowl in spectacular fashion to Auburn last week. It looks like Ingram made some kind of bet on the game with one of his teammates, because he showed up to practice yesterday decked out in Auburn gear. At least Ingram can take solace in the fact that he is no longer the biggest bust of an Alabama running back in the NFL. He's got Trent Richardson to thank for saving him from that distinction.